Talking to new generation Koreans are now easy with the help of English language. This country is no longer ensnared with their own language because nowadays, they are gradually embracing the English language to connect to the world. Although there are still a lot of young Koreans who cannot speak English, at least some of them are learning the language, thanks to the Hagwons and other English training centers in Korea. One of the most popular language education institutions I guess in South Korea is the English Village. This is an education program that provides an environment for the students to speak English language as a way to communicate with people. Koreans don’t need to go out of the country and learn the language because these English Villages can help them immersed into it through the aid of the activities and programs. 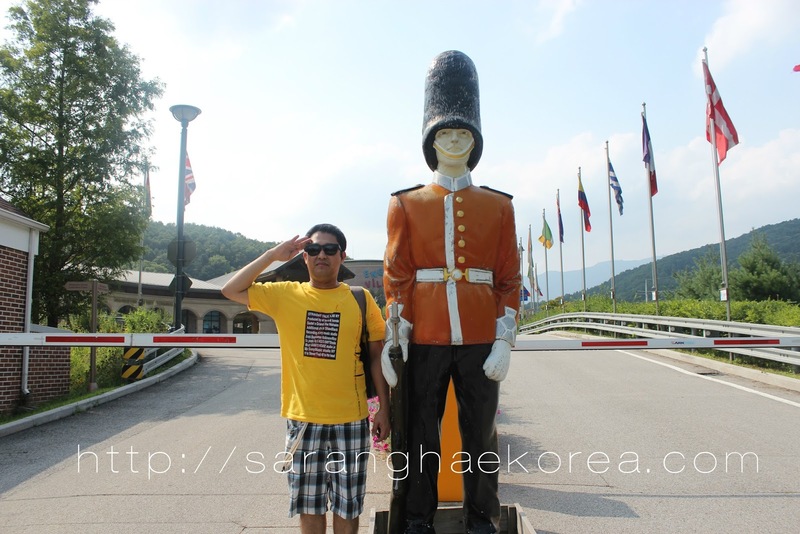 Two of these English Villages are located in Gyeonggi province. One is located in Paju, and the other one is in Yangpyeong. And yes, I’ve visited both villages for a tour. Weird, right? These places are actually an educational institution and not tourist spots, but the thought of bringing a village with English-speaking culture in another country makes it a very interesting place to visit. So what is this culture I am talking about? Well, if I am going to compare the English camp in Paju and in Yangpyeong, I can see a lot of similarities as well as the differences. I can share some of them so that in case you decide to visit one of the camp, you know what to expect. 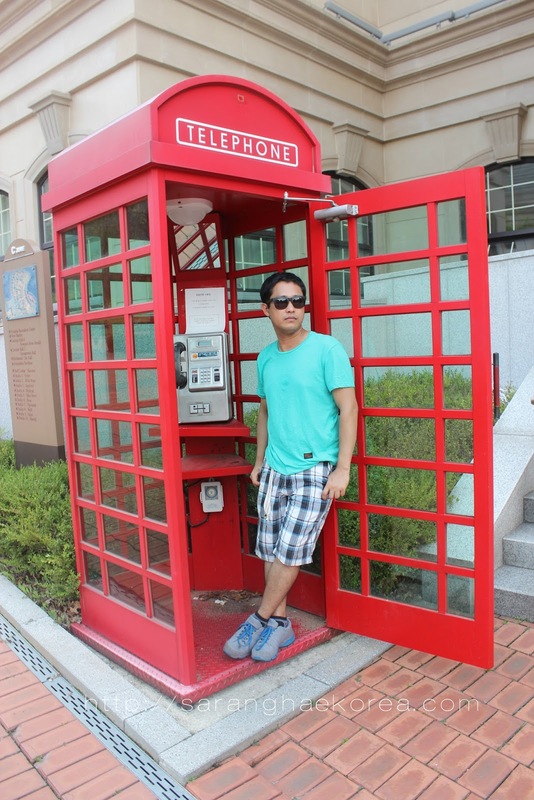 Let’s start with the most obvious, the red telephone booth. Both camps have several telephone booths, and it’s not just a telephone booth, it is a red telephone booth. But it’s not working, it’s just there for display. What about these red telephone booths? Well, I always associate this with British colonies. In fact, this is a British cultural icon and when you go to UK (not that I’ve been there), this is a common sight, and you can easily spot it because it’s…..red! Have you been to Buckingham Palace? But if there’s something recognizable when you go there, it’s the shouting red color of the foot guards. They usually wear red, black pants and an awkward looking black hat. I am sorry I don’t know how to describe their uniform, but it looks something like this! I guess what makes this place an instant star is because both campuses have been the shooting location of different Korean TV shows. For example, the Gyeonggi English Village in Yangpyeong has been the shooting location of “Boys Over Flowers. And we can’t help to reenact some of the scenes when we started to recognize the place. This was used as the school campus of that TV show. When we say England, we could not help but associate one of its famous cultural property, the STONEHENGE!!! 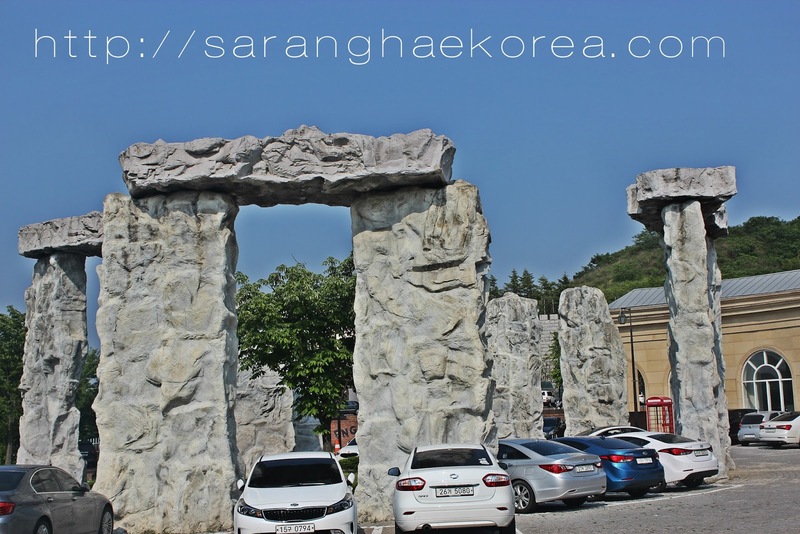 In one of the gates of English village in Paju, there’s a Stonehenge inspired structure. Although it’s not exactly a replica of Stonehenge, it is obviously all about it. In Yangpyeong campus, there is no such thing as this. 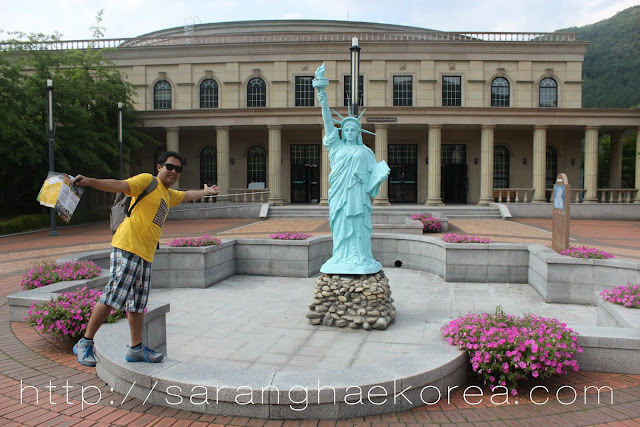 If there’s one thing in Yangpyeong that you cannot see in Paju, it’s the Statue of Liberty which we always associate to New York. This striking structure is undeniably an effective strategy of Yangpyeong campus to remind everyone that this is an English speaking place. 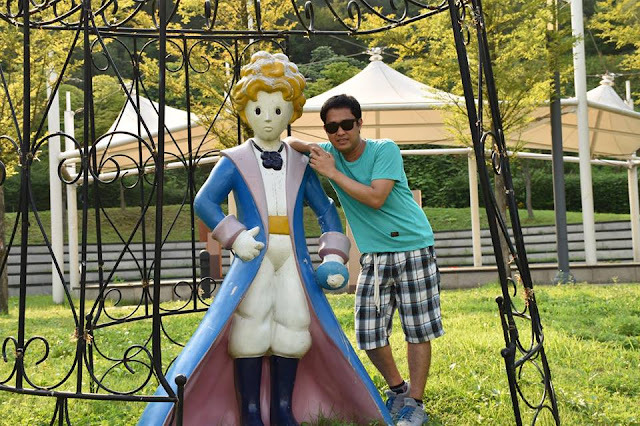 Another thing present in Yangpyeong is the homage to the well loved novel of Korea, The Little Prince. There is no such thing in Paju, but in Yangpyeong, you can find a human size Little Prince in the area. 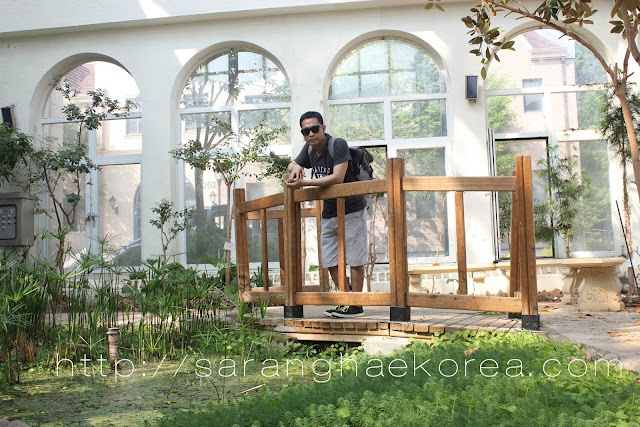 Although both campuses are surrounded by mountains and trees, the Paju campus has its own botanical garden inside the building. It’s not that all the floras and faunas in the surrounding mountain is not enough, this place is made in an indoor area. 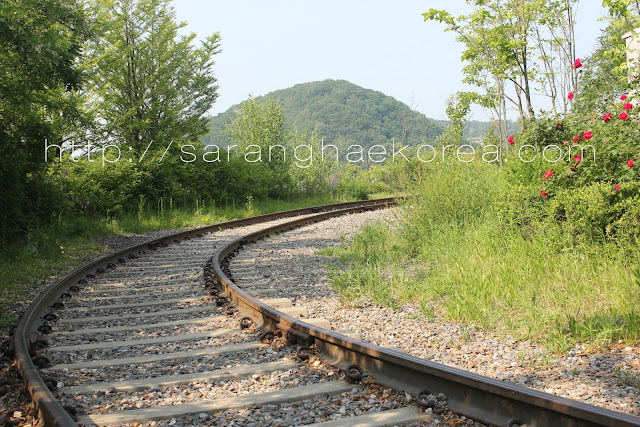 An additional fun activity to enjoy your visit in Paju English village is the railbike which is built inside the campus. In Yangpyeong, there’s also a railbike but it’s already outside the campus. I guess if I have to sum it up, the Paju campus is an England inspired village while the Yangpyeong campus is a US inspired village. But that’s just me. You be the judge if you visit one or both campuses. Via Subway: Get off at Hapjeong Station, go to Exit 2 and take Bus number 2200 and then get off at Paju English Village. Via Subway: Get off at Yongmun Station, that’s the last station of GyeonguiJungang Line. When you arrived at Yongmun Station, go to Exit 1 and take a Taxi to "Yongeo Maul". It costs around 5,000 won. If I have to choose between the Yangpyeong camp and Paju camp, my heart goes to the Paju camp. Nice. I've been to the English Village in Paju. I'm not actually a huge fan of it. It's a nice place to go look around I guess though. I might check out the Yangpyeong one, when i make it out there one of these days though. I never knew it was one of the locations of Boys over Flowers, I bet that's a big draw for several tourists, even ones that already speak English! Very cool post! I've always wondered what the English village in Paju was like! We've been to Heyri twice and loved it, but always spent most of our time there and never made it over to the village. you and your friends looked like you were having fun with your trip. 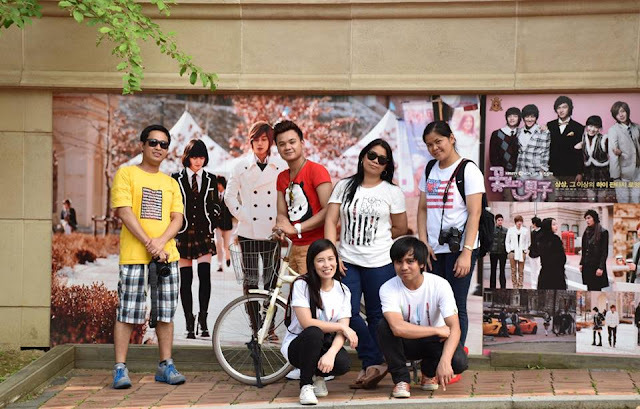 Boys over flowers was really popular in our country. By the eay, did you have a good time during that mini-presscon where we were invited? I didn't make it:-). Hi Ms Wendy. Yes, we had a good time during the presscon. sayang at wala ka po. This is HILARIOUS! I had no idea you could visit even if you're not a student. I was actually supposed to work at the location in Paju but the recruiter couldn't get it together fast enough. Did you catch any shows? Hello. In paju camp, yes, there's a magic show when I went there. Only few audiences though. And I think they are preparing for the play called Three Musketeers. THIS IS ABSURD!!! I didn't even know these English Villages existed in Korea but why am I not surprised when they've embraced English learning to such an extreme. I can't believe they erected a mini Stonehenge! That's pretty funny. Although my issue is that I've often wondered if associating English to places is harmful stereotype. This is why Asian countries tend to invalidate English speakers from different countries, because of this kind of imagery. I was reading the other day that per capita, India has the 2nd largest demographic of English speakers around the world yet no Indian (unless they were raised in one of the seven "native" English speaking countries) would be considered a qualified English speaker by Korean standards. It's just very complicated it seems. Oh my what a place! Are these open for visitors or just for students? I'd like to see the Stone Henge! This is so interesting! I only recently found out about English Villages, as I thought the only teaching jobs were with either the Public school system or Hagwons. Thank you for giving us all a good look around what is inside the English Villages! Oh wow, I haven't heard of this place yet! Is that a fun place to work at? I find all the miniature statues hilarious! I definitely want to see one of those myself! This is so neat and so effective. If I was a student, I'd be excited to come here every day and would be motivated to practice my English daily. I'm definitely interested in visiting now! Thank you for sharing and it's good to know there new teaching opportunities other than EPIK or hagwons. There are music videos, TV commercials and shows being filmed here in Paju EV all the time. We also have the Global K Pop center who have produced Produce 101 and Boys 24 recently.